Hip 232 – Bar B Fame N Bling, a Frenchmans Guy yearling filly, was purchased for $40,000 by Ray Hill of Kirbyville, Texas. SHAWNEE, OK—NOVEMBER 8, 2018—The 39th Triangle Fall Sale which was held October 26 and 27 at the Heart Of Oklahoma Expo Center in Shawnee, Oklahoma had a total 545 horses cataloged. The overall high seller and the highest selling barrel horse was a gorgeous 2017 gray filly, Hip 232 – Bar B Fame N Bling. The yearling filly, who is by Frenchmans Guy and out of the Dash Ta Fame mare, Miss Mitos Whiskey, was consigned by Bar B Ranch of Lufkin, Texas, and purchased for $40,000 by Ray Hill of Kirbyville, Texas. 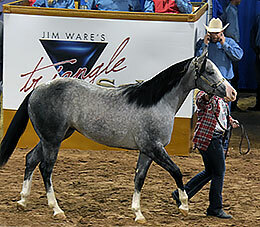 "Overall the entire performance horse business is strong", said Jim Ware, owner of Triangle Sales. He continued "Our theory with barrel horses is this: we’ve pushed and promoted the yearling market, which is different from other sale venues. I believe that is the future…as you can’t expect all breeders to breed, raise and train them. That is just too much for a breeder in any industry to do." In an effort to encourage the yearling barrel horse market, Ware believes the cycle needs to start over sooner, so Triangle Sales rewards three year olds by offering the John Read Foster Challenge incentive, and plans are in place to continue to make it bigger. The John Read Foster yearling prospects averaged $7,800. Another high-selling barrel horse yearling was Hip 237 – Frenchie Bug. The 2017 sorrel filly by BHR Frenchies Socks and out of the Blazin Jetolena mare, Ms Blazen Bug, was consigned by Vaughan & Mary Watkins, Madison, Mississippi, and purchased for $15,000 by Myra Deen, Tennyson, Texas. The barrel horses in all categories averaged $5,300. Hip 192 – Feature For You, a 2004 bay mare by Feature Mr Jess and in foal to Eddie Stinson, was consigned by Ware Racing & Ranching LLC, Millsap, Texas, and sold to Denis Winn, Agent, of Shawnee, Oklahoma, for $17,500. Four supplemental embryos by Dash Ta Fame averaged $12,150. "It’s like in any other discipline right now, the market is pretty sire-sensitive," Ware commented. The JB Quarter Horse Dispersal, which involved horses from their South Texas ranch being sold due to the devastation from last year’s Hurricane Harvey, averaged $4,300. The high selling JB Quarter Horse was Hip 166 – Ms Bay Dillon. The 2005 bay mare by Confederate Leader, in foal to Mrjbfirstandfamous, sold for $16,000 to Mary Helen Lett, Brooklyn, Mississippi. Hip 222 – Mr Jb Im Famous Too, a 2012 sorrel gelding by Dash Ta Fame and out of the Fire Water Flit mare, Miss Jb 055, was purchased by Brett Clark of Grand Saline, Texas, for $13,000. Among the horses at the Triangle Fall Sale, there were also cutting horses, reining horses, Shawnee horses (ranchers, riders, and ropers), and paints. The high selling cutting horse was Hip 135 – Mamas Royal Smoothie, a 2013 sorrel gelding by Smooth As A Cat, who was sold by John Mancuso, Plantersville, Texas for $29,700 to Wade Ray of Groveton, Texas. For the cutting horses, the trained horses under saddle averaged $12,960 and the overall cutting horse category average was $10,080. The high selling reining horse was Hip 277 - Maximus De Oro, a 2011 palomino gelding by Boon San O Lena, consigned by Mozaun & Sarah McKibben, Whitesboro, Texas, and sold to Chris Ulrich of Cuero, Texas, for $36,200. The trained reining horses under saddle averaged $14,320 and the average for all reining horses was $10,040. For the Shawnee Horses which included ranchers, riders, and ropers, the high seller was Hip 430 - Captain Cat, a 2010 sorrel stallion by High Brow Cat, sold by Matt and Wendee Wood, Purcell, Oklahoma and bought by the Danny Hern Family of Abilene, Kansas, for $29,000. The Shawnee Horses average for trained horses under saddle was $7,150 and the overall average was $4,200. The high selling Paint was Hip 294 - Mark This Rocinante, a 2007 bay/tobiano gelding by Mark This Spot, consigned by Mozaun and Sarah McKibben and sold for $33,000 to Mark Teel, Wilson, Oklahoma. In summary, buyers were from 30 states and Mexico; 81 percent completed sales; 53 horses entered the Triangle Sales Top $10,000 Club for 2018 and all geldings under saddle averaged $9,800. "The overall sale was really, really good," Ware said. "When you sell as many as we do and as many types of horses as we do, it’s easy to realize we had another Fall Sale with a really strong average." Those averages include: total average $5,900, Top 10 average $25,900, Top 20 average $20,800, Top 50 average $15,500, and Top 100 average $12,050. The next Triangle Sale will be January 25 & 26, at the Heart Of Oklahoma Expo Center in Shawnee, Oklahoma. The deadline for entry is December 7, and the nomination form is posted for download on trihorse.com.